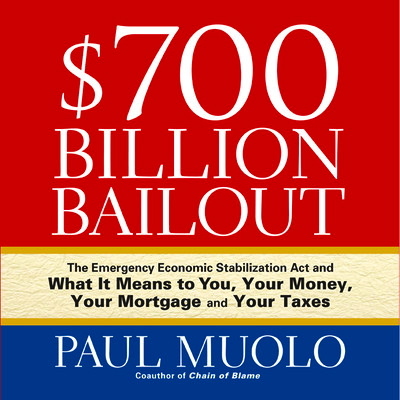 With the economy on the brink of meltdown and elections looming, a reluctant Congress abruptly reversed course and approved a historic $700 billion government bailout of the battered financial industry. The 263-171 vote capped two weeks of tumult in Congress and on Wall Street, punctuated by urgent warnings from Bush that the country confronted the gravest economic disaster since the Great Depression if lawmakers failed to act. 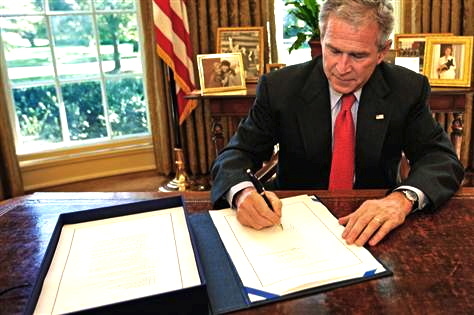 President Bush signs the Emergency Economic Stabilization Act of 2008 in the Oval Office after the House passed the financial bailout bill Friday. 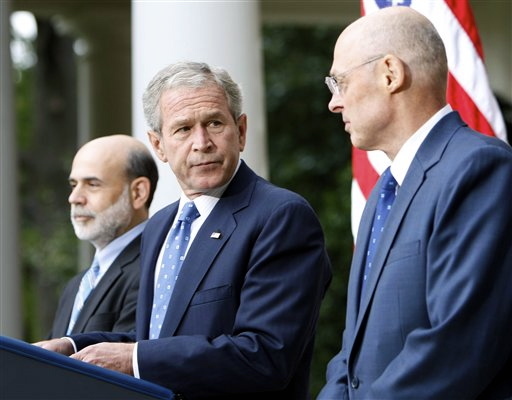 President Bush signed into law Friday a historic $700 billion bailout of the financial services industry, promising to move swiftly to use his sweeping new authority to unlock frozen credit markets to get the economy moving again. Stocks were down moderately in late tradingafter the successful vote. Earlier, stocks had been up sharply. 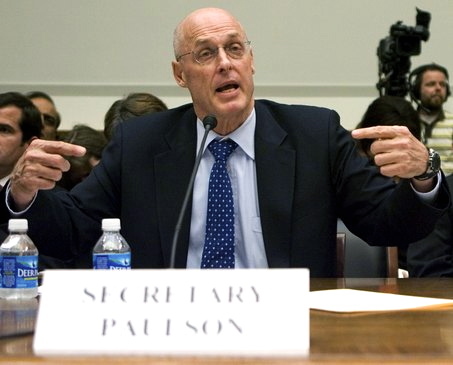 Treasury Secretary Henry Paulson and Federal Reserve Chairman Ben Bernanke, who first sounded the alarms that set the rescue plan in motion after Lehman Bros. and other institutions foundered last month on Wall Street, also welcomed the news. The calculus for Speaker Nancy Pelosi, D-Calif., and other House leaders was whether the additions would lure enough support to overcome new objections from conservative members to the added costs. Twelve switched votes were needed to pass the bill; in the end, 58 House members signed on, including Zach Wamp, R-Tenn.
“We’re out of choices. Our backs are up against the wall,” Wamp said. House leaders said the difference was lawmakers’ work to shift the focus from the bailout of financial companies to the boost it would give homeowners, small businesses and individual investors. “All the attention was on Wall Street, and we wanted to turn that attention,” Pelosi said after the vote. “I think that we have come up with an incredible piece of legislation that addresses not just Wall Street but also Broad Street,” the main business district of his hometown, Sumter, S.C. 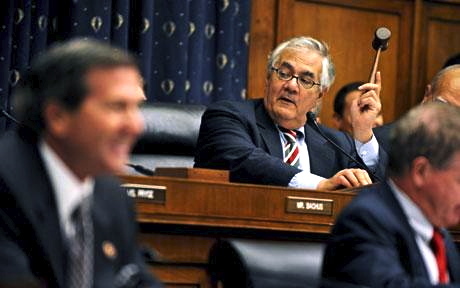 But Rep. Barney Frank, D-Mass., who as chairman of the Banking Committee did the heavy lifting on persuading members to sign on, said the work was only beginning. Pressure on holdouts grew Friday after the Labor Department said the economy lost 159,000 jobs in September , the most in more than five years, a worrisome sign that the economy is hurtling toward a deep recession. That came on top of Thursday’s Commerce Department report that factory orders in August plunged by 4 percent. 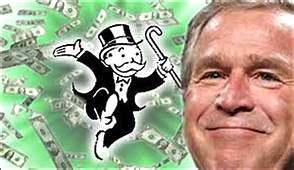 Bush lobbied aggressively for passage of the bill, which Tony Fratto, a spokesman for the White House, said was not necessarily intended to boost the economy. “It’s to avoid a crisis,” he said. The two major party presidential candidates, Sen. Barack Obama, D-Ill., and Sen. John McCain, R-Ariz., also supported the bill and worked to ensure its passage. The vote was House leaders’ second stab at the legislation after the Senate jumped the line and passed its revised version Wednesday. Some of those provisions were not so obnoxious to business owners like Carl Adams, a real estate agent in Paducah, Ky. Preserving banks’ ability to fuel the economy is crucial, he said, but to do that, the banks have to stay healthy. “If the banks’ money dries up — in other words, they can’t afford to lend us money for our clients — then you’re going to see everything snowball from there,” he said. Tom Costello, Mike Viqueira and John Yang of NBC News and the following NBC affiliates contributed to this report: KSBH of Kansas City, Mo. ; WBIR of Knoxville, Tenn.; WKYC of Cleveland; WOAI of San Antonio, Texas; and WPSD of Paducah, Ky.